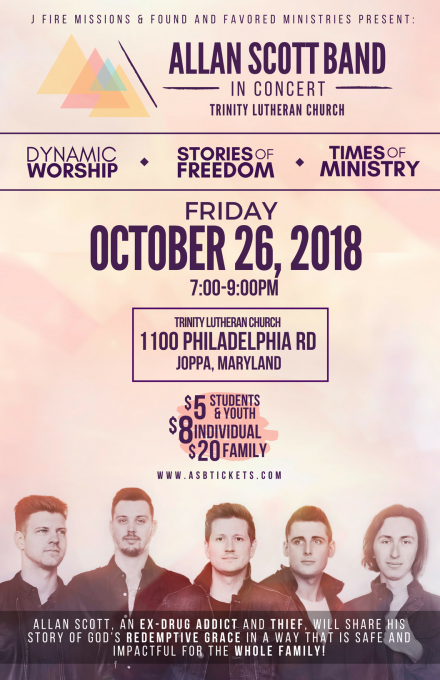 Come join us for a night of high energy music, times of worship, and ministry featuring Allan Scott Band! Allan Scott, an ex-drug addict and thief, will share his story of God's redemptive grace in a way that is safe and impactful for the whole family. You will leave knowing that God is faithful and able to restore any situation! A portion of ticket proceeds will benefit Trinity Lutheran Church Youth Missions (J Fire Missions). A freewill offering will be taken at the event. Allan's music and testimony of Gods redeeming grace have been featured nationally and internationally on programs like TBN's "Praise the Lord", CBN's "The 700 Club", "Worship with Andy Chrisman" and "Focus on the Family". Allan has ministered alongside artists such as Citizen Way, 7eventh Time Down, JJ Weeks Band, Paul Baloche, Kari Jobe, David Crowder, Big Daddy Weave, Jason Crabb, John Waller, Plumb, Anthem Lights, Abandon & David Dunn.